Should I smile because we are friends or cry because we are just friends? Blessed with the gift of the gab, Apurv manages to charm everyone in his company. Like most teenage boys, he longs for a girlfriend but hasn't found one yet. In another part of town, beautiful and popular Amyra leads a flawless life. All the boys desire her and all the girls want to be her best friend. A chance encounter with Amyra in the college canteen makes Apurv fall head over heels for her. But it isn't long before he realizes that she is not interested in him, at least not in the way he wants her to be. 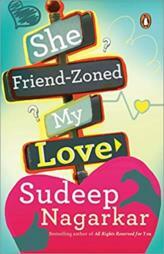 Can Apurv get Amyra to change her mind before it's too late, or will he be friend-zoned forever?